There was once upon a time a king, but where he reigned and what he was called, I do not know. He had no son, but an only daughter who had always been ill, and no doctor had been able to cure her. Then it was foretold to the King that his daughter would find her health by eating an apple. So he ordered it to be proclaimed throughout the whole of his kingdom, that whosoever brought his daughter an apple with which she could find her health, should have her to wife, and be king. This became known to a peasant who had three sons, and he said to the eldest, “Go out into the garden and take a basketful of those beautiful apples with the red cheeks and carry them to the court; perhaps the King’s daughter will be able to find her health with them, and then you will marry her and be king.” The lad did so, and set out. At this the little man said, “well, so shall it be, and remain,” and went away. At length Uele arrived at the palace, and made it known that he had brought apples which would cure the King’s daughter if she ate them. This delighted the King hugely, and he caused Uele to be brought before him, but, alas! When he opened the basket, instead of having apples in it, he had frogs’ legs which were still kicking about! On this the King grew angry, and had him driven out of the palace. When he got home he told his father how it had fared with him. Then the father sent the next son, who was called Sam, but all went with him just as it had gone with Uele. He also met the hoary little man, who asked what he had there in the basket. Sam said, “hogs’ bristles,” and the hoary man said, “well, so shall it be, and remain.” When Sam got to the King’s palace and said he brought apples with which the King’s daughter might find her health, they did not want to let him go in, and said that one fellow had already been there, and had treated them as if they were fools. Sam, however, maintained that he certainly had the apples, and that they ought to let him go in. At length they believed him, and led him to the King. But when he uncovered the basket, he had but hogs’ bristles. This enraged the King most terribly, so he caused Sam to be whipped out of the palace. “Just get away, you stupid fellow, you must wait till you are wiser,” said the father to that, and turned his back. “Well, then, so far as I am concerned you may go, but you will soon come home again,” replied the old man in a spiteful voice. The boy was tremendously delighted and jumped for joy. “Well, act like a fool. You grow more stupid every day,” said the father again. But Hans was not discouraged, and did not let it spoil his pleasure, but as it was then night, he thought he might as well wait until the morrow, for he could not get to court that day. All night long he could not sleep in his bed, and if he did doze for a moment, he dreamt of beautiful maidens, of palaces, of gold, and of silver, and all kinds of things of that sort. Early in the morning, he went forth on his way, and directly afterwards the little shabby-looking man in his icy clothes came to him and asked what he was carrying in the basket. Hans gave him the answer that he was carrying apples with which the King’s daughter was to find her health. “Then,” said the little man, “so shall they be, and remain.” But at the court they would none of them let Hans go in, for they said two had already been there who had told them that they were bringing apples, and one of them had frogs’ legs, and the other hogs’ bristles. Hans, however, resolutely maintained that he most certainly had no frogs’ legs, but some of the most beautiful apples in the whole kingdom. As he spoke so pleasantly, the doorkeeper thought he could not be telling a lie, and asked him to go in, and he was right, for when Hans uncovered his basket in the King’s presence, golden-yellow apples came tumbling out. The King was delighted, and caused some of them to be taken to his daughter, and then waited in anxious expectation until news should be brought to him of the effect they had. But before much time had passed by, news was brought to him. And who do you think it was who came? It was the daughter herself. As soon as she had eaten of those apples, she was cured, and sprang out of her bed. The joy the King felt cannot be described. But now he did not want to give his daughter in marriage to Hans, and said he must first make him a boat which would go quicker on dry land than on water. Hans agreed to the condition, and went home, and related how it had fared with him. Then the father sent Uele into the forest to make a boat of that kind. He worked diligently, and whistled all the time. The icy man said, “So it shall be, and remain.” By evening Uele thought he had now made the boat, but when he wanted to get into it, he had nothing but wooden bowls. The next day Sam went into the forest, but everything went with him just as it had done with Uele. On the third day Stupid Hans went. He worked away most industriously, so that the whole forest resounded with the heavy blows, and all the while he sang and whistled right merrily. At midday, when it was the hottest, the little man came again, and asked what he was making. In the evening, when the sun had turned into gold, Hans finished his boat, and all that was wanted for it. He got into it and rowed to the palace. The boat went as swiftly as the wind. The King saw it from afar, but would not give his daughter to Hans yet, and said he must first take a hundred hares out to pasture from early morning until late evening, and if one of them got away, he should not have his daughter. Hans was contented with this, and the next day went with his flock to the pasture, and took great care that none of them ran away. Before many hours had passed came a servant from the palace, and told Hans that he must give her a hare instantly, for some visitors had come unexpectedly. Hans, however, was very well aware what that meant, and said he would not give her one. The King might set some hare soup before his guest the next day. The maid, however, would not accept his refusal, and at last she began to argue with him. Then Hans said that if the King’s daughter came herself, he would give her a hare. The maid told this in the palace, and the daughter did go herself. In the meantime the little man came again to Hans, and asked him what he was doing there. He said he had to watch over a hundred hares and see that none of them ran away, and then he might marry the King’s daughter and be king. “Good,” said the little man, “here is a whistle for you, and if one of them runs away, just whistle with it, and then it will come back again.” When the King’s daughter came, Hans gave her a hare into her apron, but when she had gone about a hundred steps with it, he whistled, and the hare jumped out of the apron, and before she could turn around was back to the flock again. When the evening came the hare-herd whistled once more, and looked to see if all were there, and then drove them to the palace. Early the next morning he went onwards, and on his way arrived at another castle in which he again stayed the night. 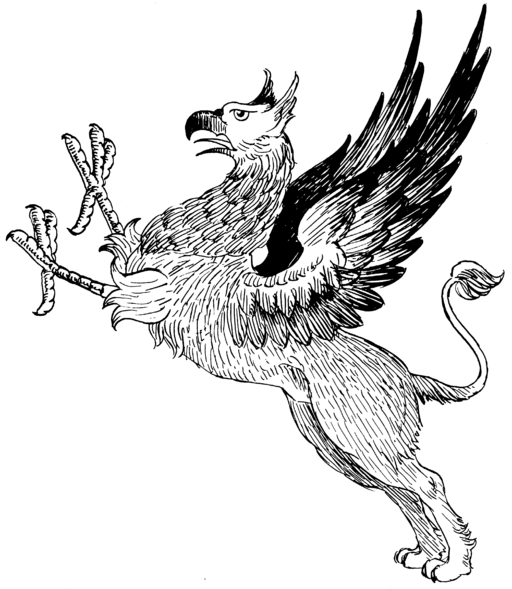 When the people who lived there learned that he was going to the griffin, they said they had in the house a daughter who was ill, and that they had already tried every means to cure her, but none of them had done her any good, and he might be so kind as to ask the griffin what would make their daughter healthy again. Hans said he would willingly do that, and went onwards. Then he came to a lake, and instead of a ferryboat, a tall, tall man was there who had to carry everybody across. The man asked Hans whither he was journeying. “To the griffin,” said Hans. “Then when you get to him,” said the man, “just ask him why I am forced to carry everybody over the lake.” “Yes, indeed, most certainly I’ll do that,” said Hans. Then the man took him up on his shoulders, and carried him across. At length Hans arrived at the griffin’s house, but the wife only was at home, and not the griffin himself. Then the woman asked him what he wanted. Thereupon he told her everything—that he had to get a feather out of the griffin’s tail, and that there was a castle where they had lost the key of their money-chest, and he was to ask the griffin where it was—that in another castle the daughter was ill, and he was to learn what would cure her—and then not far from thence there was a lake, and a man beside it who was forced to carry people across it, and he was very anxious to learn why the man was obliged to do it. Then said the woman, “Look here, my good friend, no Christian can speak to the griffin. He devours them all, but if you like you can lie down under his bed, and in the night, when he is quite fast asleep, you can reach out and pull a feather out of his tail, and as for those things which you are to learn, I will ask about them myself.” Hans was quite satisfied with this, and got under the bed. Early the next morning the griffin got up and went out. Then Hans came forth from under the bed, and he had a beautiful feather, and had heard what the griffin had said about the key, and the daughter, and the man. The griffin’s wife repeated it all once more to him that he might not forget it, and then he went home again. First he came to the man by the lake, who asked him what the griffin had said, but Hans replied that he must first carry him across, and then he would tell him. So the man carried him across, and when he was over Hans told him that all he had to do was to set one person down in the middle of the lake, and then he would never have to carry over any more. The man was hugely delighted, and told Hans that out of gratitude he would take him once more across, and back again. But Hans said no, he would save him the trouble, he was quite satisfied already, and pursued his way. Then he came to the castle where the daughter was ill. He took her on his shoulders, for she could not walk, and carried her down the cellar steps and pulled out the toad’s nest from beneath the lowest step and gave it into her hand, and she sprang off his shoulder and up the steps before him, and was quite cured. Then were the father and mother beyond measure rejoiced, and they gave Hans gifts of gold and of silver, and whatsoever else he wished for, that they gave him. And when he got to the other castle he went at once into the woodhouse, and found the key under the log of wood behind the door, and took it to the lord of the castle. He was not a little pleased, and gave Hans as a reward much of the gold that was in the chest, and all kinds of things besides, such as cows, and sheep, and goats. When Hans arrived before the King, with all these things—with the money, and the gold, and the silver and the cows, sheep and goats, the King asked him how he had come by them. Then Hans told him that the griffin gave everyone whatsoever he wanted. So the King thought he himself could make use of such things, and set out on his way to the griffin, but when he got to the lake, it happened that he was the very first who arrived there after Hans, and the man put him down in the middle of it and went away, and the King was drowned. Hans, however, married the daughter, and became king.